It was thrilling to the very end! Who would win the Swedish Song Contest 2011? It turned out to be between the teengirl favourites Danny and Eric Saade – just as I guessed. Personally I crossed my fingers for Eric, so I was definitely happy when he won! A good song to start the contest with. One of this year’s favourites among the Swedish people, and I think this song will be played a lot at clubs this summer. Personally I find the chorus to be too repetitive and boring, but my overall impression is that it’s an okay song to listen to in the background. Happy, up-beat, pop. This sounds like a classic Swedish folk song, and I like it! In between all brightly colored and modern pop songs it’s great to find something that sounds genuinely Swedish. Sara Varga was very beautiful in her long white dress, she’s got a great voice with a lot of emotion and I liked the song. I have to admit I’m starting to like this song – a lot. The first time I watched him perform it I was shocked by all the colors, shapes, weird clothes and the whole performance. I laughed at the monitors in the background: “That’s sooo Monty Python!” But now I’ve heard the song a few more times I find it hard to not like it. I’m dragged along in all the bubbling happiness, and give The Moniker a hight marks despite his original performance. Brolle disappointed me this time. His style (which is obviously inspired by Elvis) and voice didn’t save the song or the performance tonight. The song isn’t strong or powerful compared to the rest, and singing out of tune was not the best way to end the song. A disappointment. Linda Bengtzing – E de fel på mig? This song is just as happy-sounding and pop as all the other songs she’s participated with earlier, and it was wonderfully colorful. But I’m sceptical about the lyrics and I think I’m not the only one – maybe that’s the reason she didn’t do very well this year? The surprise of the year. He’s getting negative points from me regarding his clothes, but the song is good and his voice is okay. Sadly his voice cracked slightly now and then, maybe because he’s been practicing so much for the final round? I don’t know. This is not the kind of song I expected him to sing, but he does it well! What a great song! Now when I’ve heard it a few times. This is also one of the songs I didn’t like when I heard it the first time, but it’s getting better and better. I agree with those who think that the performance is confusing. There are a lot of colors and shapes and patterns, and there’s a lot going on on the stage. But this feels like a summer hit – at least I will be listening to it a lot! It was fun that he lives outside of Örebro – and such a cute kid he has! One of my personal favourites. Sanna is known for singing ballads. This is also a ballad, but it’s an up-beat ballad. I liked her clothes, I like her voice, I like the song. This will also be heard a lot at my place. I’m in love! One of the fun songs of this year. The Playtones became famous thanks to them participating in Dansbandskampen and I didn’t expect to see them here. I still don’t think they fit in the Eurovision Song Contest but their performance was a fun element in the contest. The song has a lot of influences from the 1950′s (a musical period I personally like) and they did right in dressing alike. The question is whether blue was the right choice of color… But the song is good. And finally, my favourite! I think that both the song, the dance – the whole performance, in fact – is on at least the same level as his performance last year. But as Eric himself says, this year it’s a more “grown up” pop song compared to Manboy and that should be good as he himself has grown since last time… The song is easy to learn and sing along with. He and his dancers are incredibly good, they had they best performance of the night, without a doubt. The glass cage is a cool element that strengthens the message of the song, and I do hope he will be allowed to bring it with him to Düsseldorf. But despite the great song, I think that a lot of Eric’s success lies in his incredible charm, energy on stage and his dark glittering eyes. It will be interesting to see if he is as successful in Europe as in Sweden! 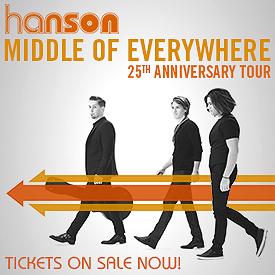 ← Hanson @ London – x5!